On May 1st Su Beng was invited to speak at the Chung Shan Medical University located in Taichung. Su Beng waiting at the Taipei main train station for the high speed rail to Taichung. While waiting for the high speed rail, Su Beng's assistant Bin Hong gave him the daily Facebook status update. A poster for Su Beng's class at Chung San Medical University on May 1st. Class is now in session with Su Beng. The pamphlet on the desk was written by Su Beng and is about Taiwanese nationalism. It was handed out to students that day. Here's my now familiar handy HD digital video camera (courtesy of my MAKING HISTORY contributors), which has appeared in several of my photos. It accompanies me everywhere I go with Su Beng. It's captured several historic moments during the occupation of the Legislative Yuan, recorded my interviews with Su Beng and documented my time here with Su Beng. I am so glad that I've upgraded from recording on miniDV tapes! I'm reminded of the generosity and support of contributors to the MAKING HISTORY campaign each time I use it. Afterward Su Beng stopped by Taiwan Tati Cultural and Educational Foundation for afternoon tea and some lively discussion. Since I arrived in February, I've been meeting with Su Beng weekly regarding the biography. I've also been able to do quite a bit of background research on topics related to Su Beng's biography. Besides meeting with several Taiwan history professors, I've met with people to discuss topics such as: the White Terror Era in Taiwan, Kuomintang in China (during the 1940s), the Chinese Communists in the 1940s, underground radio in Taiwan (Su Beng had an underground radio show in the 90s), and the Presbyterian Church of Taiwan. After one of my weekly interviews with Su Beng, I was invited to join him for dinner with his friends in an old neighborhood of Taipei called "Banga" (in Taiwanese). Of course someone brought along a copy of Su Beng's TAIWAN'S 400 YEARS OF HISTORY and asked Su Beng to sign it. There was lots of sake. Yes that's a container of sake in the photo below! Look closely at the center of the photo and you'll also see Su Beng's signature (史明). The restaurant's owner asked Su Beng to sign the wall behind him! It was a fun night with lots of merriment and traditional Taiwanese food with a twist like this oyster omelet sandwich. Like I've said before, Su Beng maintains a very busy schedule. On the weekends he often opens his home to groups of "young" people wish to visit with him. By "young" I mean twenty-somethings and thirty-somethings (i.e. those under the age of forty). So it wasn't anything out of the ordinary when Tony Chang of 台獨流行ing invited a group of young people over to Su Beng's on May 10th. The group plans to meet with Su Beng weekly! Su Beng had a captive audience that night. Here's a group photo taken at the end of the night. On May 14th Su Beng was invited by students of Fu Jen Catholic University to speak there. Afterward there was an impromptu dinner with Su Beng. Some of the students wanted to hear more from Su Beng, since he had been allotted a little less than an hour to speak. 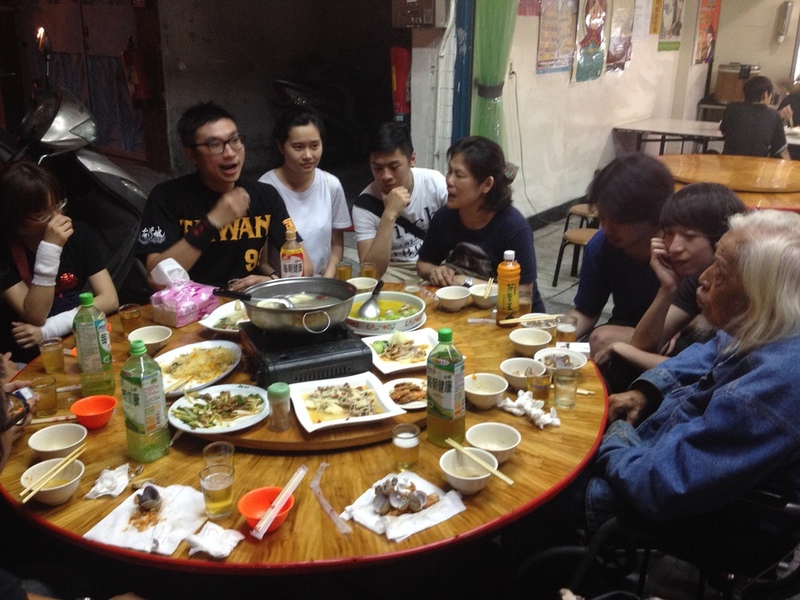 Su Beng generously invited the students to eat with him, as I've seen him do several times before. I've heard that when he was living in Japan and running his noodle shop there, he'd often invite overseas Taiwanese students over for a bite to eat- on him. When this passerby (who happened to live in the neighborhood) saw Su Beng, he went home to get his copy of TAIWAN'S 400 YEARS OF HISTORY. Then he came back with it to ask Su Beng to sign it. To be continued... my next post will be about the last half of May.